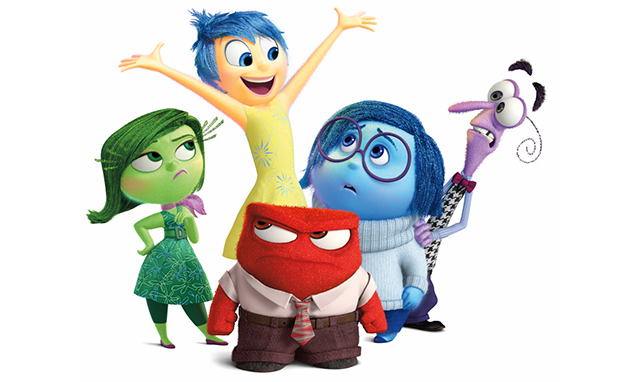 My son’s favorite movie nowadays is Inside Out. He would literally watch it every day if we let him. He quotes the characters all the time and retells the jokes. In case you are not familiar, the movie takes place inside an 11-year old girl’s head and the main characters are her emotions: Joy, Anger, Fear, Sadness and Disgust (I would call her Judgment for adult audiences). 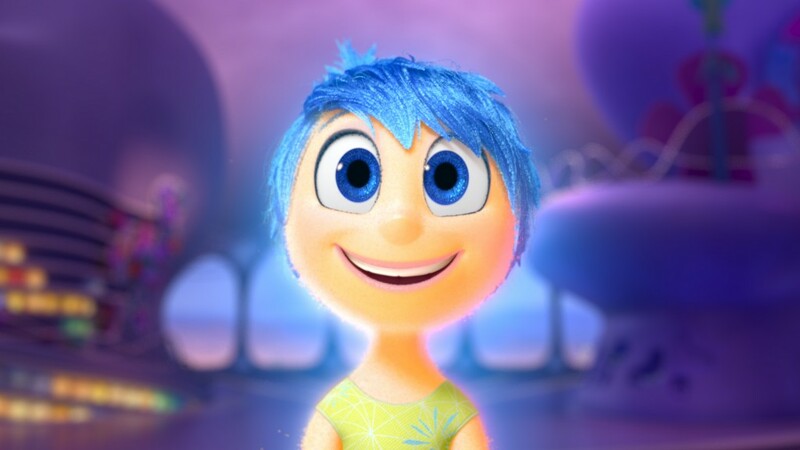 When I ask my son who his favorite character is, he always says, “Joy”. And when I ask why, he says, “Because she is happy”. In fact, Joy IS the main character. The movie portrays the little girl Riley living from the place of Joy, with other emotions serving their purpose when necessary. I am a big fan of the movie myself and believe that it beautifully illustrates some of the fundamental yogic ideas. Despite popular perception, yoga is not about perfecting one’s Chatturanga Dandasana, but about becoming consciously aware of the contents of our minds, and gradually learning how to manage our unruly emotions, perceptions and reactions. And Joy is at the center of it all. The yogic map of personality (The Panchmaya model) describes five layers of the human system with the deepest and most important layer called Anandamaya, from the word ananda, which means “joy, unending bliss”. So this deepest layer of joy is meant to illuminate our physical bodies, our energy and physiology, our thoughts and behavior. One’s yoga practice can often feel like work, and it should be, especially when we bump up against our physical or mental resistance. And it will remain just that if we keep the focus superficial and are unable to reach deeper layers within our systems. But if we manage to find a way to touch something deeper within us, the experience of one’s yoga practice can become truly transformative. How do we reach deep in the context of a yoga practice? Well, talking about it is not necessarily the answer. I remember attending a yoga class a while ago where the teacher talked at length about various spiritual topics weaved interestingly with movement instructions and other yogic ideas. It went something like this “Lift your leg up, up, up – hold it there – squeeze harder, harder – bliss is your true essence – lift your mula bandha” and so on. This type of approach usually doesn’t work for me. The Anandamaya layer is powerful but subtle, so just giving it lip service often doesn’t accomplish the desired affect. 1. Move deeper and deeper inward. 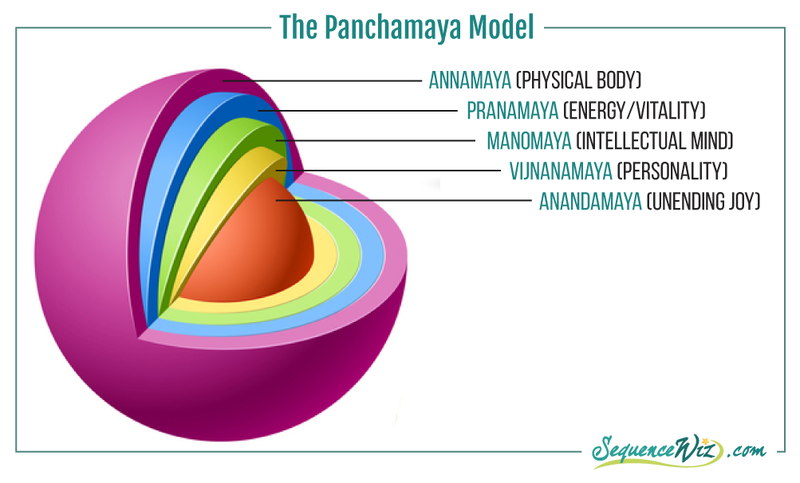 We have layers, too, and the Panchamaya model is often depicted as five layers moving from gross to more subtle: physical body – energy/physiology – mental processes – conditioned responses and behavior – sense of joy and connection. We can follow the same path if we want to gradually take our attention deep within and experience the state of joy and peace. So we begin with movement, then tune in to the breath, then become aware of our thought patterns, then notice our conditioned responses. As a result of this journey we have an opportunity to step out of our own mental drama and observe it without judgment. Once that space is created we can shift our perception of self from “I think, therefore I am” to “I am, therefore I think”, which means that we can stop defining ourselves through our thoughts. Once the clouds of thoughts part, they reveal the sun that was there all along. This is ananda; our true essence. Now this process can be formal or informal; it can be crafted skillfully by the teacher or happen spontaneously. The bottom line is that if you do your yoga practice with attention to breath and inner awareness of your own thoughts and responses, you have a much better chance of having that experience. And the more often you practice like that, the easier it becomes to get there. During my first conversation with a new yoga client I always ask – What do you enjoy doing? It is surprisingly effective in shifting people’s perspective. After talking at length about challenges, issues and shortcomings, if you ask a client “What do you do for fun?” many people are taken aback. As they start to reflect on things that bring them joy, they relax, soften, open up, take a step back to notice the big picture of their lives. This is an essential step in working with physical, physiological and mental-emotional issues – the ability to recognize that “I am not my condition”. Those joyful things don’t need to be big, dramatic or profound. One of my clients found great joy in cleaning her refrigerator. This action was both literal and symbolic for her, it helped her clear her mind. So whatever it is that gives us joy, we need to help our clients (and ourselves) identify it and encourage them to engage in it more often. A traditional way to tap into the inner bliss is by connecting to something larger then ourselves. It doesn’t matter what spiritual or religious tradition you connect to – if there is a prayer that fills your heart with joy, you can always reach for it when you need a reminder of what’s truly important. And ritual is any action, no matter how mundane, that you infuse with meaning, even if this meaning is uniquely yours. Some examples of simple rituals relating to the yoga practice include lighting a candle, putting some fresh flowers in your practice space, or just simply rolling out the mat mindfully or bringing the palms together in Anjali mudra. Your ritual can be simple or elaborate, but whatever you choose to do, make sure that it means something to YOU. Aside from major life challenges, most of the time it is up to us to decide on the main emotion that we want to live our lives out of. Do we want Fear to rule our inner Headquarters? Or will it be Anger? Or will it be Judgement? Or will it be Joy? And once we make that decision we can use our yoga practice to sort through the clutter and unearth our inner Joy. Perfect post for the Winter blues! I have seen this model presented the way you have it, a more Western approach from the gross to the subtle, but I also have seen it the Eastern way – from the subtle to the gross, where Ananda is the outermost layer. I have also heard it mentioned that the layers are not neatly separate but rather inter-woven. These different representations have taught me that joy may be something that needs excavating sometimes, but sometimes it is the first thing you see when you look. Here’s to cleaning out the fridge! :))) That’s beautiful, I love the way you put it. I’ve also seen the Panchamaya model presented in many different ways; my teacher, for example, uses the image of a bird. The bottom line for me is that we are multidimensional, and all those dimensions constantly interact and affect each other. So it can be useful to look at them separately to make it easier to study, but in reality they never function in isolation. Funny ’cause GKācarya didn’t even teach us catturānga dandāsana– but I think it helped him earn his living on Maui as a yoga therapist because it’s so hard on the shoulders. Thanks Olga for your posts. I really appreciate them. As far as emotions are concerned my daily practice is leading me to accept whatever comes as a guide to understand myself and my reactions. Hi Paola! I agree that all emotions have their place and help us manage things that come our way, and they all should be accepted and appreciated. When we talk about ananda though, the yoga tradition says that it is our natural state, underneath all emotional turbulations. You can call it joy, or wonder, or bliss; theoretically we can live out of that place which makes it easier to both embrace and manage our emotions. Beautifully said! And funny story about your son; my son Scott was the same way when he was little – he could watch the same movie over and over, would relish telling me the storyline (over and over 🙂 and knew the dialogue . 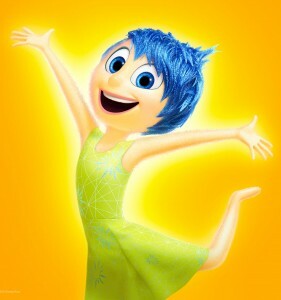 . . joy! I so appreciate the time and energy you put into your work. You have been a true guide for me, as a viniyoga teacher and it’s nice having you out there. Keep up the good work. Previous story How do you know what a yoga pose is meant to accomplish?